Ace Sign Company in Springfield, Ill., has a history of providing innovative signage with custom features to their clients. 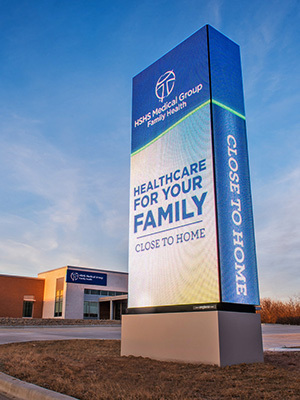 Their recent efforts for HSHS Medical Group at a family clinic in Chatham, Ill., earned Ace the Grand Prize in the 2018 Watchfire LED Sign Awards. Watchfire Signs established the awards program in 2014 to recognize Watchfire dealer partners who best showcase the capabilities of outdoor digital advertising. The fourth annual awards recognize on premise signs installed in 2017 that display excellence in design, legibility of digital messages and advertising effectiveness. The HSHS Medical sign features a vertical freestanding monolith showcasing a 16’ by 16’, 16mm Watchfire edge wrap display. Custom content by the Ace Sign Company creative team incorporates an architectural dynamic that utilizes the capabilities of LED signage technology. For a complete list of winners, visit: www.watchfiresigns.com/signawards. Smart customers do their homework. Learn how to select an LED sign manufacturer in this guide.